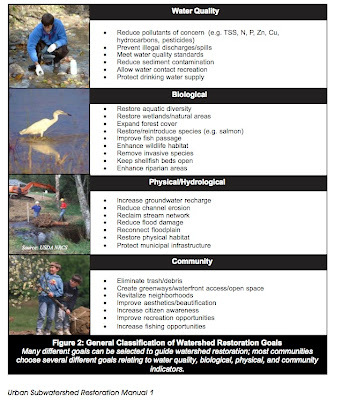 Every month since January 2001, volunteers have taken the time to visit designated monitoring sites within the Ventura River watershed to collect important water quality information. This successful program is the joint effort of Santa Barbara Channelkeeper and the Ventura County Chapter of the Surfrider Foundation. 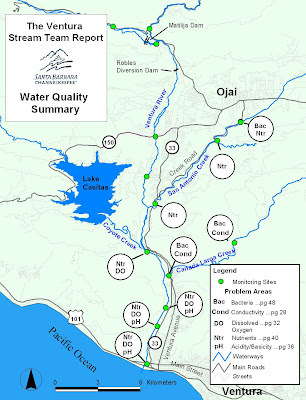 The data is used by State and local government agencies as part of an ongoing effort to identify and solve water quality problems in the watershed. Why Stream Team? Watch this video to learn more. Below is a summary of what we've found. All seven years of data is available on the web at www.stream-team.org Our events are the first Saturday of each month - get involved! In order to begin to understand the causes of coastal degradation, we have to look at the past. It is only when you speak with the "old timers" that you begin to wonder... what have we lost? This is described well by the term Shifting Baselines; "... the chronic, slow, hard-to-notice changes in things, from the disappearance of birds and frogs in the countryside to the increased drive time from L.A. to San Diego." As part of our Ocean Friendly Gardens initiative, we have been collecting historical images of the city. 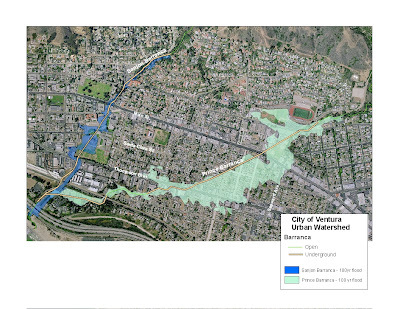 Here is a short animation showing the changes to the Sanjon barranca and coastal wetlands, from the original 1872 survey to the present. Watch this a few times and notice how the barranca (dry creek) was incrementally paved over and then the freeway finished the job. 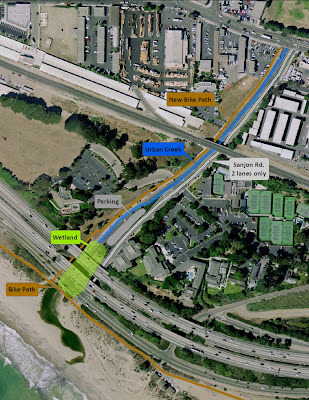 The result of all this pavement is the lost ability of the land to absorb and filter stormwater, instead flushing all land-based pollutants directly into the surf zone. 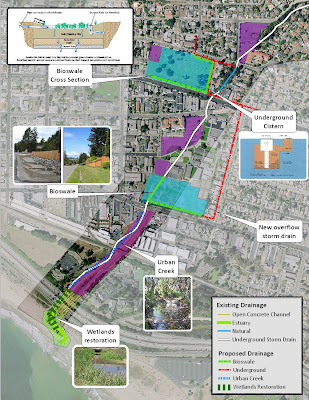 The image below shows the other side-effect: increased flood risk when urban runoff overwhelms the aging storm drain system. Future posts will begin to outline some of the solutions to this problem.